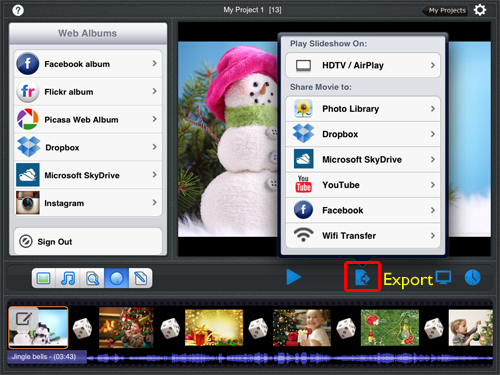 Photo Slideshow Director HD enables you to create a stand-alone slideshow with music and kinds of transitions, then directly upload a video slideshow to Facebook for sharing with friends. 1. Tap Export icon and choose Facebook from Share Movie to list. 2. 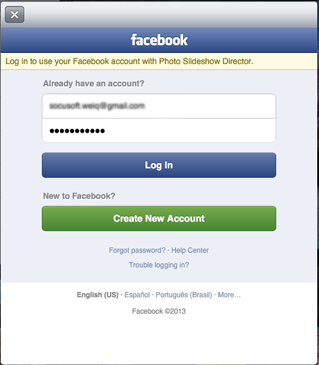 Enter your Facebook account information in the pop-up Facebook window, then tap Log In. Note: If you do not have a Facebook account, tap the Create New Account to register an account. Or you can go to Facebook website and sign up. 3. After taping Log In, you will see this window, tap Allow All to enable Photo Slideshow Director to post a slideshow to your Facebook. 4. In the Upload Video window, enter title and description for your slidehow, and choose a video resolution from 360p / 540p /720p. A HD 720p video can showcase your photos in best quality. 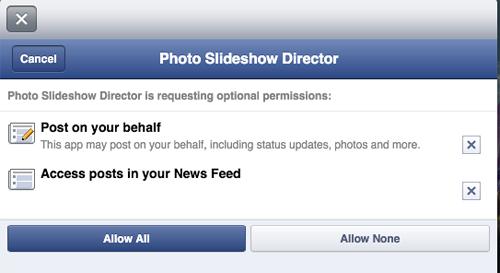 Also you can set the viewing permission for the video.